The instant “Mcely Miracle”. Fine green clay stimulates blood flow to the skin, absorbs all inpurities and excess oil. A rejuvenating effect is achieved with precious essential oils and with the high content of minerals in the clay and Dead Sea salts. 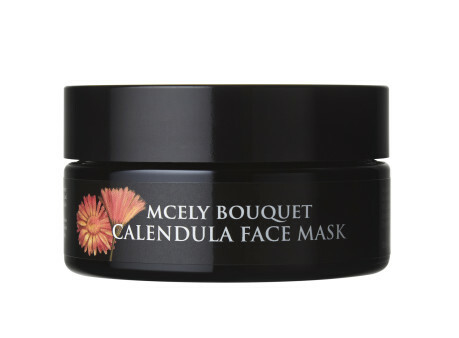 Calendula extract heals, calms, and softens the skin. The mixture of essential oils and herbal extracts was formulated to tighten the skin, add radiance and balance the production of sebum whilst ridding the mind of negative thoughts and exhaustion. Face masks in powder form are currently the trend with exclusive brands as they offer maximum effect. Your face mask is always freshly made and absolutely at its best. The powder form is completely free of preservatives, and thanks to this new consistency, it lasts longer. Calendula, green clay, Dead Sea salt, rose, frankincense. Combine with Rose Conditioning Mist to create your desired consistency – for skin that’s more dry, use more Conditioning Mist; for oilier skin, use less. The product is suitable for all skin types – it’s entirely up to you how you prepare it and how long you let the mask work. With its elegant bowl and brush, you can indulge in a mini cosmetic ritual and enjoy an uplifting experience when you prepare the mask. Apply generously all over your face avoiding eyes and lips and allow it to work for 5-10 minutes. Rinse off with warm water and follow with your daily moisturizer or Rose Facial Serum.